Playing pranks on campers and counselors at summer camp helps kids bond, have fun together, and break up the routine of scheduled activities. The best camp pranks should be lighthearted and not mean-spirited or physically dangerous so they are fun and safe for everyone. Look for pranks that don't need a lot of supplies and make sure your camp is open to harmless practical jokes. From secret snacks to group meals, messing with food is easy, harmless and fun. If you can't smuggle in the ingredients for these pranks, you might be able to sneak them from the dining hall. All you need is green food coloring and a moment alone with light-colored foods like sugar cookies, bread or waffles. 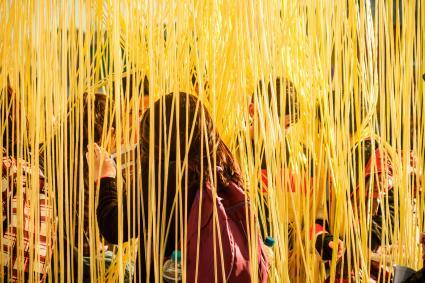 When no one is looking, drip a couple drops of green dye across a loaf of bread or a big batch of pasta. Other campers will be grossed out when they reach for the food, and counselors or cooks will be confused. Under the disguise of generosity, make fake s'mores for your friends or counselors. Use real graham crackers on the outside to make it appear normal. On the inside, spray whipped cream into a melted marshmallow shape and top with a few pieces of baking chocolate. When your target bites into their "s'more," the whipped cream will squirt out all the edges and the bitter chocolate won't be appealing. Serve up refreshing fake lemonade to unsuspecting campers. You'll need a gross, edible liquid that is the same color as regular or pink lemonade. The juice in a jar of banana peppers is a good yellow option while the juice in a jar of maraschino cherries is good for pink. Dump the juice into a cup or pitcher, then add enough water to dilute the color. It should be a pale pink or yellow when you're done. Wait until after a physical activity then offer your concoction. Even if people like these flavors they won't expect it and will probably spit the drink out. All you need for this funny prank are chocolate jimmies, those tiny sprinkles you get on ice cream that look like little rods. Sneak into the dining hall when it's empty, but before a big meal, and sprinkle jimmies all over the tables and chairs. 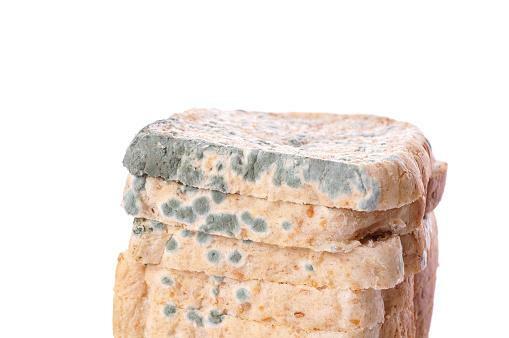 When people first walk in, they'll either think the place is covered in ants or mouse droppings. Either way, they'll be grossed out! One of the easiest times to play tricks on people is while everyone is sleeping. Slumber party pranks work well at summer camp since every night is like a sleepover with friends. You'll need to be stealthy and able to stay awake longer than others to pull off these sleeping pranks. 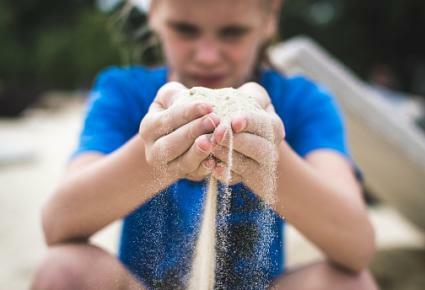 If you've ever been to a beach or played in a sandbox, you know sand is tough to get rid of. Bring sand with you or grab some from the camp beach and wipe a little inside your target's sleeping bag. The tiny grains will get stuck in the fuzzy fabric. During the night they may find the sand itchy, and they'll wake up covered in it in the morning. Your friends aren't likely to get all the sand out even if they wash the bag a few times. If you don't have access to sand, glitter also works great. When the target of your prank is asleep, give her a makeover by applying some not-so-pretty makeup. For best results use bright, ugly colors in powders and creams that are easy to swipe on. To finish, wipe hand lotion in her hair. She'll have no choice but to scrub up good in the shower to get it all off. A fun, customizable prank to play on your fellow campers is to fill their pillowcase with bubble wrap so it pops when they lay down. Fold up bubble wrap until it is about as thick as your target's pillow then replace their pillow with the bubble wrap inside the pillowcase. When they lay down, it will pop and scare them. Another noisy pillow option is to place a small balloon or whoopee cushion under their pillow, inside the pillowcase. If you want a bigger impact, put a filled water balloon under their pillow. When your target lays down for the night, it will pop and soak her bed. You'll need tons of those large craft supply googly eyes and glue dots for this practical joke made for bunk beds. After everyone goes to sleep, use the glue dots to stick giant googly eyes around the underside of the top bunk. When the person on the bottom bunk wakes up, they'll be startled by all the eyes on them. Pulling pranks in the bathrooms, your cabin and other places used by a lot of people allow for more anonymity. Camping pranks meant for larger groups take advantage of equipment left in the open and public spaces. To pull this one off, all you need to do is smuggle a can of tuna and a can opener into a cabin. Open the can and leave it under a bed or another location where it won't be detected easily. After a few days, the tuna will start to stink, and counselors and campers alike will have fun trying to locate the source of the odor. This one is best pulled in a cabin you aren't sleeping in. Set this prank up after everyone falls asleep. Getting up when it's still dark and walking to shared bathrooms is scary enough for many campers. However, this prank will give them an even scarier image. Gather thick mud and place small clumps of it in each toilet. Make sure the mud isn't full of large rocks or other things that could clog the toilets. When campers go to use the bathrooms, they'll find "poop" in all the toilets! Every camp has marshmallows, and that's all you need for this trick. Gather melted marshmallows then head to a cabin. Tie every pair of sneakers like normal then smear melted marshmallow on the bows. The white color of the marshmallow will blend in with standard white shoe laces so your victims won't anticipate this surprise. When kids go to put untie their shoes, their hands will get covered in sticky goo. Putting a little Vaseline or other slippery substance like hair gel on a doorknob makes it almost impossible to open. Rub some of your slippery stuff on the outside handle of a cabin or bathroom door. This will prevent people from getting into the room, but won't trap people inside in case of an emergency. Make sure to smooth it out on the doorknob so it's not noticeable. You'll need to plan ahead for this silly prank. Before you head to camp, gather items others might be embarrassed to get caught with. For example, boys might not want others to see they have a girl's underwear or a stuffed animal in their duffel bag. Girls might get embarrassed if everyone sees a picture of their mom or a kiss-coated poster of a cute guy in their bag. One night when everyone is asleep, stash these secret items in the top of each person's bag. When everyone is getting dressed in the morning, they'll notice the embarrassing items in each other's suitcases. Extreme pranks involve doing something so big it affects nearly everyone at camp similar to a senior prank at school. This can be tough to pull off and usually requires a team effort from a few tricksters. All you need is some thin string to create a maze around one cabin. Choose your target and wait until their cabin is empty. You'll want about 3 to 5 people, each with their own ball of string, to get the job done quickly. Tie one end of your string to a bed in the cabin. Walk around the room wrapping the string around the legs of the beds both high and low. Start furthest away from the door then work your way out of the cabin so you don't get stuck! When the residents return, they'll have to crawl through the maze to get to their stuff or a pair of scissors to cut it all down. For the most extreme impact, do this in the main dining hall or other large space everyone uses. The best part of this epic prank is the trickery. Take all the instrument cases at band camp or duffel bags you can get and hide them somewhere safe in camp. Gather up a bunch of random camp supplies like balls or boxes and stack them in a couple canoes. Cover the canoes with large blankets or tarps and tie them off on a buoy away from shore. When people start to notice the missing items, lead them to believe they're all out in the covered canoes. Watch as some brave souls head out to save them and discover they aren't really there! Bathrooms at summer camps are notoriously dark and creepy. Carefully cut or open glow sticks and dump the liquid into the back of all the toilets. If you get any on your hands, wash it off immediately. Make sure you wipe up any that gets on the toilet handle or seat too. Flush each toilet once to get the liquid moving. If you do this at night and remove a lightbulb, you're sure to get the biggest reaction. Make sure you leave at least one light so no one gets hurt wandering through the dark bathroom. You don't really need any supplies or planning time to pull off pranks at camp. Infested Toilet Paper: Unravel a roll of toilet paper about as much as the next person would use. Take a black marker and draw a spider or centipede a few squares in then re-roll the toilet paper. The next person to use it will get a scary surprise when they unravel the T.P. Locked Luggage: All you need are a few small safety pins to complete this prank. When your friends aren't looking, attach the two zippers of their luggage together with a safety pin. At first, they won't understand why they can't move the zipper. Spicy Drinks: If your camp serves up some classic red Kool-aid, add a couple drops of hot sauce when no one is looking. Hidden Harmless Scare: The cheapest pranks you can play are the ones that only involve people. 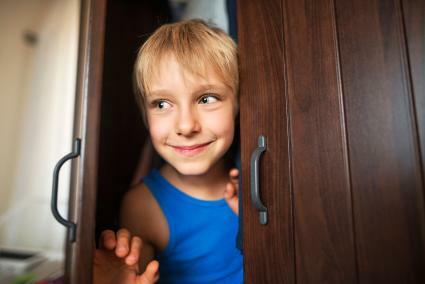 Find unexpected places to hide like in a broom cupboard or even in a bathroom stall with your feet tucked up then make a scary noise when someone opens the door. You can also sneak up on someone and stand silently until they notice you. Missing Silverware: Throughout the summer enlist a small group of friends to steal their silverware from each meal. After a couple weeks there won't be any left for meals. When you reach this point find a fun way to return them such as placing them in random harmless places around camp or using them to write a message on the ground outside the mess hall. Fake Mail: Many kids get letters from home at camp. Slip in a few pieces of fake mail that feature outrageous news from home. Defective Zip-Top Bags: Kids are often told to pack toiletries and other belongings in zip-top bags for camp. Dab a little super glue along the closure of your friends' zip-top bags so they can't open them the normal way. Harmless pranks can be fun, especially when more than one person is targeted so no one feels singled out. Plan pranks that will be easy to pull off and won't offend anyone to help lighten the mood at camp. Just remember, the key to a great prank is making sure no one knows it was you who did it!